I finished a new theme today entitled “Cherry Truffle.” For more info be sure to check out the features page and live demo. I wanted to create a theme that displayed it’s content in a traditional way (similar to Basic), but with a bit more pizzazz! I tried to keep the structure clear and organized while still maintaining a unique style. My last few designs have been fairly simplistic, so this time around I included more graphic-heavy and jQuery-enhanced features not found in PureType or Basic. 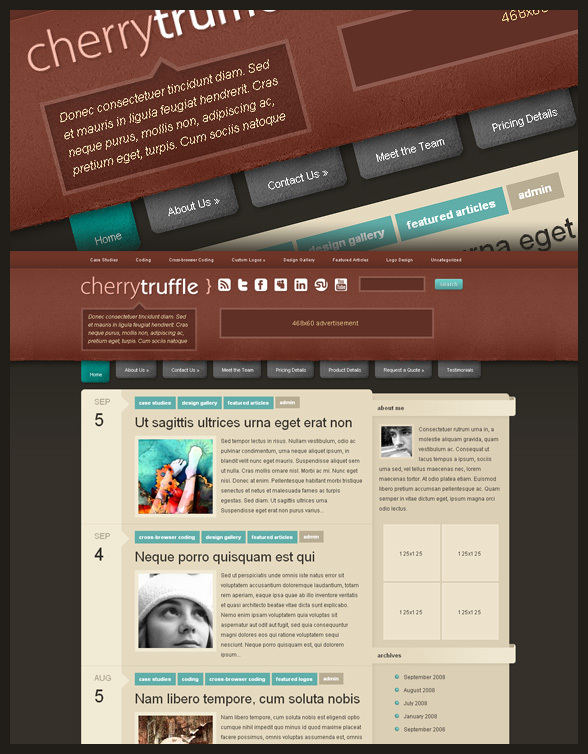 CherryTruffle comes with all the great features you have come to expect from ElegantThemes. You will find an easy-to-use Theme Options page with a list of settings that can be used to customize your blog. This theme comes with three Unique color schemes, so if the default color is not your style, try out the Blue or Purple variations. 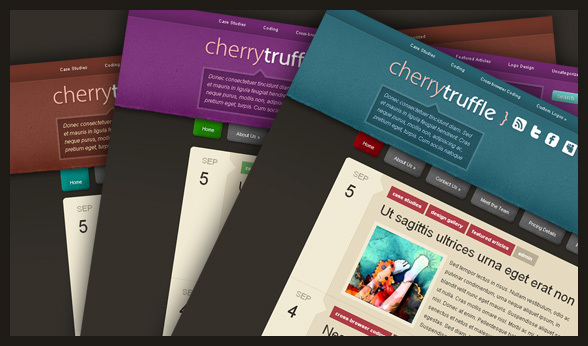 CherryTruffle also comes with two post layouts, including an optional “Blog Style” setting, which will display your posts in full on index pages. 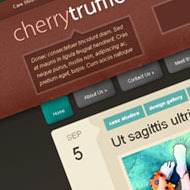 CherryTruffle also features two widget ready areas, including the sidebar and the footer. You will also find easy-to-manage 125×125 and 468×60 banner ads, multi-tier dropdown menus for pages and categories, automatically resized thumbnail images, integrated social networking links in the header, an easy-to-use “About Me” section and more! I hope everyone is doing well, expect some more great themes soon! I know that this blog has been a bit quiet these past few weeks, but don’t worry, I am still here and working hard on new stuff. Stay tuned as always! I am the founder and CEO here at Elegant Themes. When I'm not hard at work on new themes, I enjoy writing an article or two on our blog! Beautiful theme, great for personal sites! Very nice indeed. I like the little mouse over effects. Looking forward to what you do next. Very nice. Love the rollovers. Nice theme to make a come back on, good job. Very nice indeed. Good hover effects. Nice color options. Overall a great theme. Categories placement above the post title worries me a little. And i don’t understand why the concept of text transform to lowercase in everytheme? Any chance the custom fonts for the logo can be included in the theme package?? Sweet dude! My favourite yet. very nice themes with superb graphic. one thing that I do not like is the location of the post date. Wish I can make that column for the third and use the normal post date icon instead. why people don’t just download & install Firefox, but demand from designers IE6 support is so beyond my understanding that I can’t believe. I can’t stress enough that IE6=torturing web designers. I don’t think YOU understand that IE6 is losing market share very fast. It seems to me that you’re the one using IE6 [not even willing to use IE7] and want legacy and creativity restricting support. I doubt it will happen as much as you wish. I am a fan of Elegant Themes, I loved this theme, that’s why I wrote a post about it on my blog! Bravo! I’m editing the logo and will make it the theme for my personal blog. At least for a while (habitual theme-changer). Excellent stuff. I think you have the best themes out there. Thanks! Looks really great. Nice job! best theme so far ^_^ Nick is d best! What a lovely theme. Signing up with you guys all those months ago has been my best move so far. Thanks!! All your themes look like one and the same? I think you are feeling more than happy with all the sponsored comments above, and not trying to do some thing really different or new? Please delete our entry as soon as possible. Glad to see you solved the problem with create accounts without paying. Great theme – even better than the last. Now to decide default or Blue. That’s the message after I activate CherryTruffle on my web server…what should I do? You need to install the plugins that came with the theme. For full installation instructions please refer to the readme file. Also, in the future please use the support forum. Nevermind…I found my problem. Thanks for your great work. Not your best work. Awkward/obtrusive dropdown menu, tags are bulky, mish-mosh of good theme elements from other themes. Kind of a mess. Sorry, just trying to be constructive. I’ve noticed some nice SEO improvements in this one, that’s awesome! Will see how it goes! Thanks. This looks like a problem with color profiles, which means it is probably due to viewing the theme through a Mac. I will fix this as soon as possible. Yep. Sorry for not telling you. I’m on a MacBook Pro w/Leopard. I’m using this theme on my blog and just love it. It should have been much better, if you had used the ‘description’ box below the logo to display latest tweet from users twitter profile. This would have added more Social Media element to the theme. I know this can be done by cuztomised by editing the header.php file but for novice users, this could be a cool option either to enter description or display latest tweet. I am editing the file though, seems need to tweak a bit on css file as well. It’s good to see the new theme! Great colors and design. The mouseover effects on the tabs are quite bad though. Fantastic looking theme… looks professional and classy. I can feel a signing up feeling coming on, now can I afford $19.95? Lovely design, but in Opera 9 the mouseover menus jump all over the place and then land on top of each other which make them pretty unusable. Nice theme. I like Purple theme. Wow!!! nice design theme. Do you have the demo the the website on this template? Very nice theme. Thank you very much. Wow! nice theme. thanks for sharing. I am using this theme my education site. Hi I purchased membership of e.themes. and I was able to successfully installed delicatenews theme. But I tried the same with others I’ getting this error (It started with Cherry .T theme). Anysuggestions ? You might have assisted everyone a good deal on this superb publish!